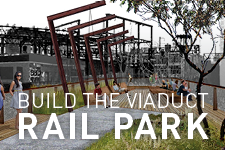 Construction Begins on the Viaduct Rail Park! 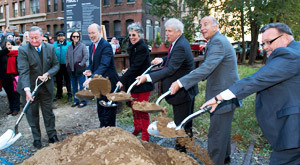 Yesterday, Governor Tom Wolf, Mayor Jim Kenney, State Representative Michael H. O’Brien, Councilman Mark Squilla, and Sarah McEneaney, President of Friends of the Rail Park and the Callowhill Neighborhood Association, joined Center City District (CCD) President Paul R. Levy to celebrate the groundbreaking for Phase 1 of the Viaduct Rail Park, which will turn a dilapidated quarter-mile portion of the former Reading Viaduct into a vibrant green park with walking paths, landscaping, lighting, seating and gathering spaces. Read the press release here. 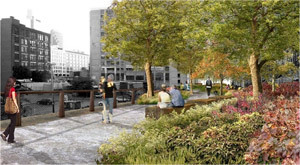 To date $9.5 million has been raised of the $10.3 million project. Help us get to our goal today by making a gift or joining our new crowd-funding campaign. 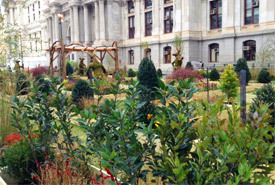 Starting November 11, wander America's Garden Capital Maze at Dilworth Park, a holiday-inspired Garden that was created in partnership with Greater Philadelphia Gardens. 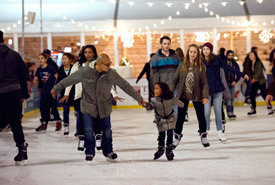 Located on the Greenfield Lawn, children and adults will delight in discovering picture-perfect moments amid the vibrant plantings, topiaries, twinkling lights, and décor that showcases all 32 public gardens, arboreta, and historic landscapes that are located in the Philadelphia area. This year's annual Zarwin Baum Fashion Touchdown, benefitting Big Brothers Big Sisters Independence Region, will feature designers Nicole Miller Philadelphia, Robbini Bespoke and ToBox, along with such Eagles players as Connor Barwin, Brent Celek, Najee Goode and Caleb Sturgis. On November 7, at the newly-remodeled Ballroom at the Ben, guests can enjoy cocktails and lite bites, while Eagles players and their wives participate in a fashion show, emceed by FOX29 Good Day Philadelphia co-anchors Mike Jerrick and Alex Holley. The event begins with a VIP reception at 5:30pm, with the main show starting at 6:30pm. Tickets: $200 VIP (no seating), $125 general admission. The Free Library of Philadelphia welcomes you to join your fellow Americans at Parkway Central Library for a unique kickoff to election night on November 8, 5:30-8pm. As part of the Library’s American Presidency Series, watch the polls, enjoy presidential trivia and other entertainment, and indulge in "red state" and "blue state" hors d’oeuvres, with other civic-minded Philadelphians in the Library’s Skyline Room and Roof Deck. Tickets include entrance and activities, open bar, food, and a memorable start to this historic night. Tickets, $15 are available here. This year's Marian Anderson Award Gala Concert on November 15 recognizes three individuals who have had a leadership impact on American popular music and who are long associated with Philadelphia – the Grammy-winning superstar Patti Labelle and the equally legendary Grammy-winning songwriting and record-producing team of Gamble & Huff (Kenny Gamble and Leon Huff). Monica Malpass of 6ABC will host the gala, with special appearances by artists whose careers began with Philadelphia International Records, including The Three Degrees, The Soul Survivors (singing Gamble and Huff classics), Philadelphia's own Kathy Sledge, and the amazing Ledisi. The Marian Anderson Award is conferred upon outstanding artists who have used their talents for personal artistic expression which has contributed to our culture in a singular manner. For more information on the award, visit MarianAndersonAward.org.